Tis the season and Arizona’s New York deli has traditional, made from scratch dishes to satisfy everyone’s memories of home. 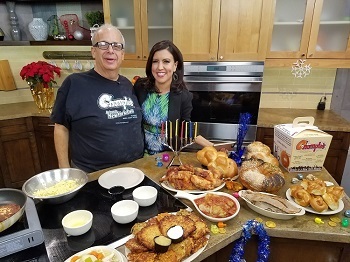 Chompie’s holiday menus for Chanukah and Christmas feature take-away family meals, sides and desserts. If you’re looking to eat dinner in the comfort of your own home New York style Chompie’s Delicatessen is offering to prepare a meal that may provide leftovers for all 8 nights. Borenstein family recipes are used to create a meal that serves 8 people and offers everything from appetizers, entree, side dishes and dessert for $219. Today is the official start of Hanukkah. And, a big part of the tradition is family, but also the amazing food. We’re making potato latkes with Chompie’s this morning and talking about the significance of The Jewish Festival of Lights, which is celebrated from Dec 12 through Dec 20 of this year. Now, Chompie’s Deli has latkes for days. Find them in menu items like Lovey’s Smoked Salmon Tapas, Grandma Sarah’s Famous Mini Potato Pancakes, and the Potato Pancakes Sampler. You can even order Upper West “Sides” at Chompie’s like the Mini Spinach Latkes, the Mini Sweet Potato Latkes, and simply, the Large Potato Pancake. Named for the owner’s grandmother, this traditional Hanukkah dish starts with hand-grated potatoes mixed with onions, salt, pepper, matzo meal, and eggs. They are then hand-molded, fried to crisp perfection, and served three to an order with sour cream and applesauce on the side.